We look after all the details, from start to finish, and always pre-build your stand in our factory before your exhibition date to ensure there are no nasty surprises on the day. This is the best quality control measure out there, and not all exhibition companies will do this for you. We will happily undertake a site survey, create mock-ups and assist in any way possible. 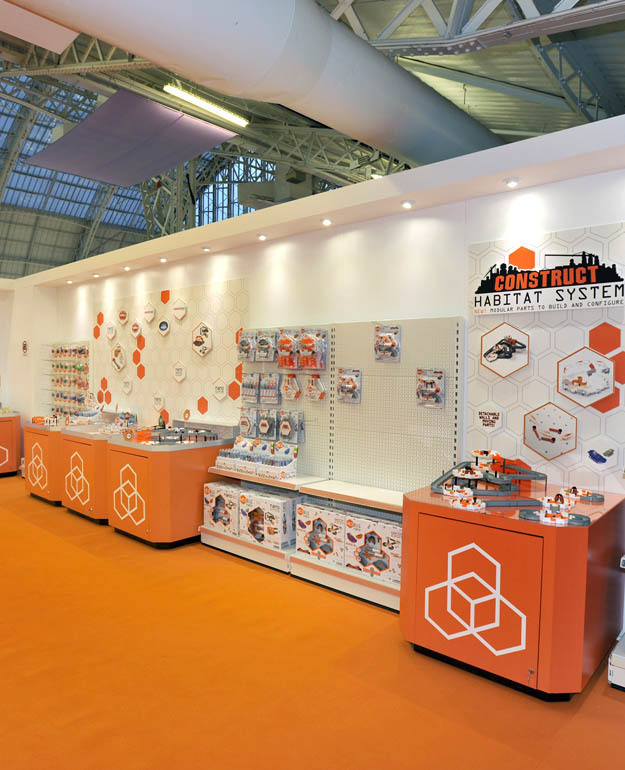 Whether your exhibition requires a full bespoke solution, a modular system or a simple portable pop-up stand, Dominion has over 30 years of experience and can print direct to any substrate (rigid or flexible), as well as directly onto fabrics. Whatever your requirements, we can assist you right from design through to installation. If you want something bespoke, we’re more than happy to design and produce an exhibition stand to ensure that your brand is showcased in the best possible way. 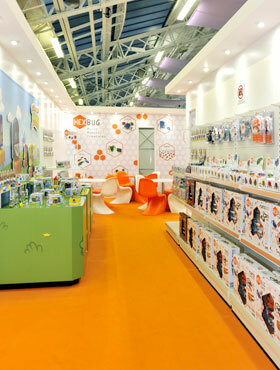 See exhibition stands in our product gallery. 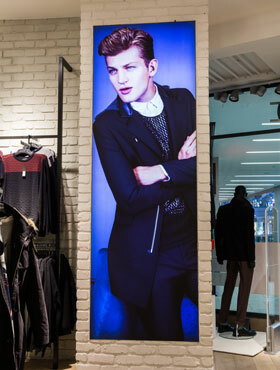 An exciting new product offered by Dominion that can be quickly installed in a huge range of free standing or permanently fixed displays. The beauty of TensionPixTM is that it allows you to easily update graphics without the need to undertake a time consuming or costly installation process. TensionPixTM is a flexible and easily expandable modular design, and the graphics can be easily rolled and folded to allow for cost-effective transportation. The fabric is pulled tight, resulting in a flat, seamless look. TensionPixTM can be supplied in various standard sizes as well as offering the flexibility of being easily adapted to bespoke installations with the option to attach a range of accessories adding yet more versatility. This means that TensionPixTM allows you to cover unique surfaces and large areas making it the ideal solution when looking for adaptable and innovative display solutions for showrooms, exhibitions, reception areas, roadshows and in-store visuals. See TensionPixTM in our product gallery. Our super large format provides the ability to produce flooring in up to 5m wide sections. We use 30m roll lengths to minimise joints. We can print any image on temporary, light use and heavy duty materials for use in both interior and exterior environments, to suit your specifications and requirement. Printed flooring is particularly popular at exhibitions, as it creates interest and attracts visitors to the stand. 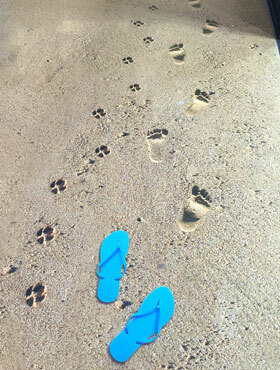 See printed flooring in our product gallery. Dominion provide a wide range of backlit graphic solutions, including menus, fabric graphics and super-wide illuminated signage for exhibitions. Using the latest print technology, our backlit graphics offer a dramatic boost over traditional methods in colour density, image vibrancy and sharpness. 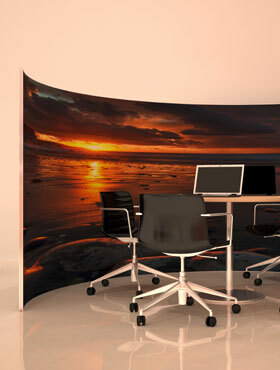 Our backlit products can be either free standing or wall mounted. We fabricate to any required size using ultra economical low energy LED lighting to suit your specific requirements. See light boxes in our product gallery. Dominion are specialists in the production of printed flags. 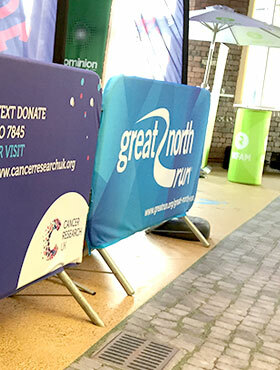 As a great form of advertising, our flags offer strong vibrant colours and we can arrange for the accompanying flagpoles to be produced and installed in all locations for your exhibitions. Using full colour print, our flags can be personalised and are manufactured using long-lasting materials. Our flags come with loopholes and eyelets as required. Make your event memorable and utilise all of the available space by advertising on the crowd barrier covers! We have put together a comprehensive range of exhibition furniture to help you take your event display to the next level. Designed to be easy to transport and assemble, our display furniture products are ideal for trade shows, in-store promotions or for long term use in offices, receptions, showrooms and presentation halls. 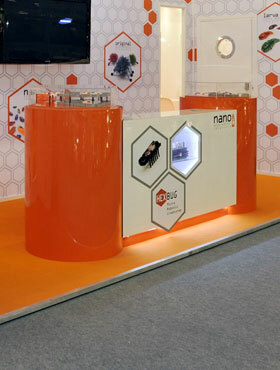 Our exhibition and display furniture products can be customised with printed graphics. These are produced in-house and can be created by our designers working from your brief. 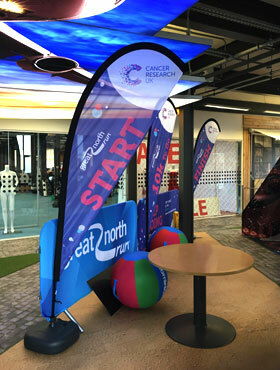 We use the highest quality materials and media to ensure vibrant display furniture graphics get your message and brand noticed. See podiums and furniture in our product gallery.